Gingerbread is a Christmas confection beloved across the globe. In Michigan, at the heart of the thumb, Caro pays tribute to the seasonal favorite at its unique Gingerbread Festival, December 5-8. 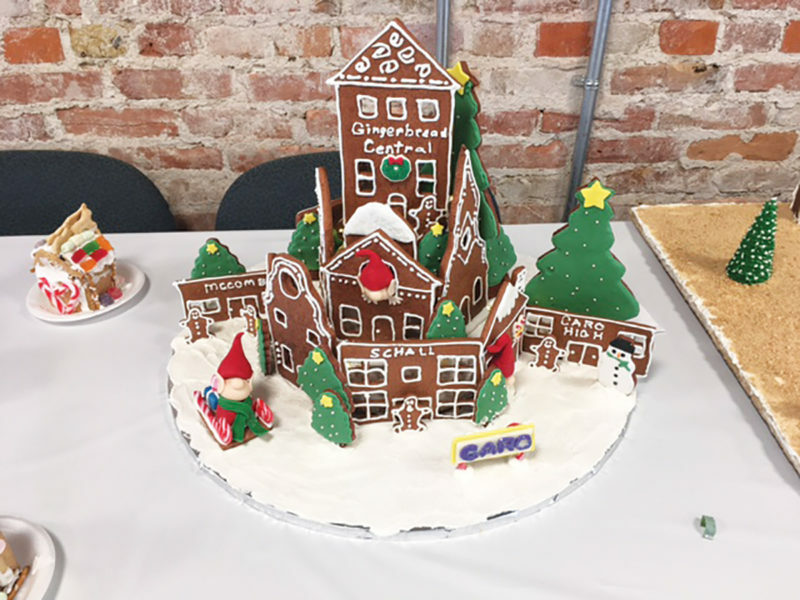 Sponsored by the Caro Chamber of Commerce, the festival is intended to celebrate simpler times and to infuse the community with holiday spirit, just as gingerbread does! Imagine a display of tiny, whimsically decorated gingerbread houses filling the local American Legion hall. A charming community is created each year by elementary school children, who construct houses using kits of milk cartons, graham crackers, icing, candies, and more. These join more elaborate gingerbread creations created by local culinary students and other adults as part of a community-wide competition. 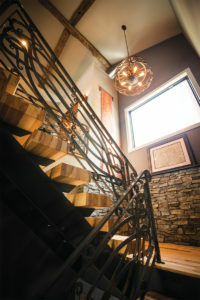 Starting December 7, folks tour the Hall and then vote for their favorite houses. Winners are determined by “penny vote,” with containers in front of each entry. In addition to bragging rights, $250 is awarded for first place, $150 for second, and $100 for third. Also on Friday evening, a tree-lighting ceremony is held at 6:00 p.m. in Trudeau Square. Family-friendly events and activities follow at an outdoor Kringle Market, where almost all events and activities are free. “Young and old can share in the fun of the Gingerbread Village,” according to April Bonk, executive director at the Chamber of Commerce. Santa arrives in the bucket of a Caro Fire Department engine. Visitors can take photos with him, a “Grinchy” character, and a life-size gingerbread family. They can also meet sled dogs, take free rides in a carriage pulled by a team of horses, and listen to holiday readings, choirs, carolers, and a jazz band. Local businesses will provide giveaways such as hot chocolate and s’mores at the market, and some lucky participants in a fundraising raffle will win festive and creatively decorated wreaths – some of which may even include gift certificates! – to adorn their homes. “People thoroughly enjoyed this last year, and I suspect it will be even more fun this year,” stated Bonk. The wreath raffle, which raises money for the Chamber of Commerce, is one of only two events that are not free. The other event is the Taste of Caro, which kicks off the festival on Wednesday, December 5, at the Brentwood, downtown. Here, local restaurants of all sorts – from fine dining establishments to coffee shops – offer specialty items for sampling. Participants pay to enter, purchase sampling tickets, and enjoy an open bar. Only 30 minutes from Saginaw, Caro is home to many beautiful historic buildings. Adding to the holiday enchantment, businesses and homes throughout the community will be thoroughly decked out for a chance to win decorating contest prizes. On December 8, Breakfast with Santa will be presented by the local McDonald’s franchise at the American Legion hall. The festival concludes following announcements and a free seasonal matinee at the Strand Theater at 1:00 p.m.
Ginger root was first cultivated in ancient China and gingerbread as we know it first appeared in Europe in the Middle Ages in many different forms – cake, bread, and “snaps” – and was eaten year round. Methods for embellishing the first gingerbread houses could have been as elaborate as gold leaf stenciling or as basic as using a cookie board, large wooden boards with pictures carved into them that were used to imprint the dough, which was turned out and baked. Immigrants to Colonial America revised recipes from their homelands based on the availability of local ingredients. Maple syrup molasses was incorporated in the north, and sorghum molasses was used in the south. Gingerbread houses became wildly popular in the mid-19th century, when Queen Victoria adopted them along with other German-based traditions such as the Christmas tree, and with the publication of Hansel and Gretel, a German folktale, by the Brothers Grimm in 1812.